Microsoft Project Online is a flexible online solution for project portfolio management (PPM) and everyday work. Project Online delivered through O365 enables organizations to get started, prioritize project portfolio investments and deliver the intended business value. 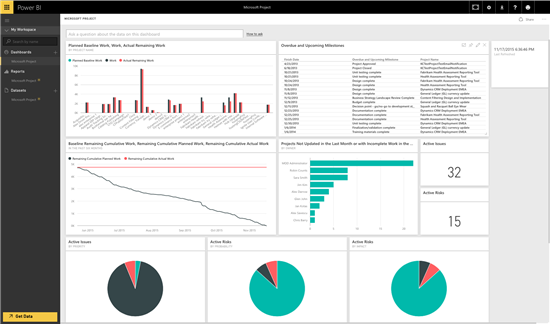 The Project Online content pack for Power BI allows you to explore your project data with out-of-box metrics such overdue projects or a burndown of current project work. This post will provide an overview on how the Power BI content pack helps users explore Project Online data and derive further insights. 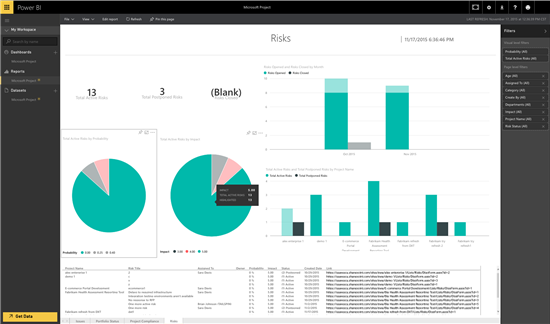 For additional details on how to get started, please see our Project Online Content Pack for Power BI help page. Start loading the content pack by connecting your Project Online account through Power BI. Once the content pack is loaded, you can begin interacting with any of the out of box content such as the dashboard, reports or asking a question of your data. Clicking on the tiles will drill into the 4 pages of reports built on top of the data set. 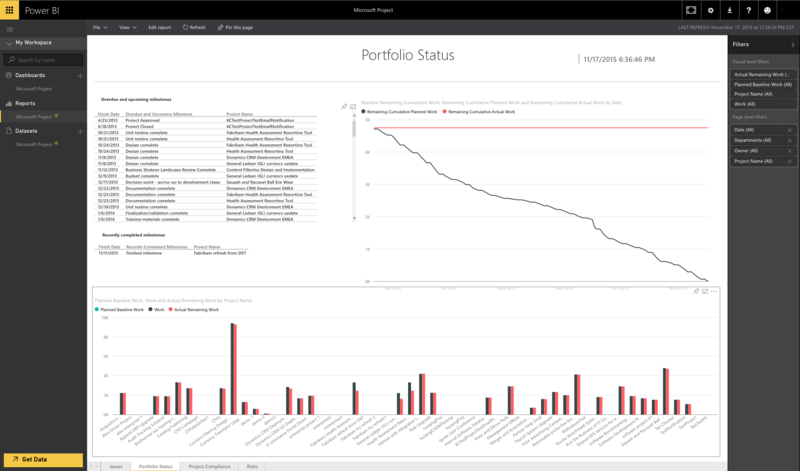 The top left tile shows a breakdown of work by project, and selecting the tile will bring you to the Portfolio Status report. Navigate between the report pages using the named tabs at the bottom. On each page, you can also switch to Edit Mode, to view all of the tables and fields that are included in the dataset. For example on the Risk pages, you can add filters, rearrange or modify existing visuals, and create new visualizations. The highlighted tables in the Fields list show where the fields come for a specific visual. 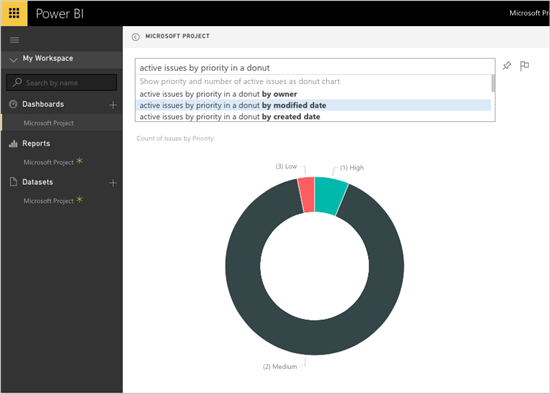 You can also try asking a question of your data, such as “show total active project out of compliance” or “active issues by priority in a donut”. If you’re not sure of what to ask, select the question box for suggested questions. You can also open the Fields and Visualizations panes on the right hand side to see the fields being used in the answer or to further customize your result. The visualizations in the answers or in the reports can be pinned back to the dashboard using the pin icon to further customize it. You can also pin to any other dashboard, allowing you to build up a view with tiles from multiple datasets and reports. On the dashboard you can edit the size, location, and presence of each tile or visualization. This allows you to tailor the reports and dashboard to your unique needs. After you initially import the data, the dashboard, reports and data set will continue to update daily. You can control the refresh schedule on the data set as well. The Project Online content pack for Power BI helps you monitor and explore your project data with an initial set of metrics and reports that can be customized for your scenario.